The prestigious medical journal BMJ has determined that James Bond was a roaring alcoholic whose heavy drinking would probably kill him before his 60th birthday. We all know that fictional British super-spy James Bond prefers his martinis shaken, not stirred, but why? The medical journal BMJ suggests that it might be due to tremors induced by years of heavy drinking. In a year-end study intended "to quantify James Bond's consumption of alcohol as detailed in the series of novels by Ian Fleming," the journal determined that while it's possible for someone to drink as much as Bond did and remain upright in day-to-day life, there's just no way he could do it while maintaining his "extraordinarily high level" of functioning. The authors of the study read all 14 of Ian Fleming's James Bond novels, noting every alcoholic drink that was taken as well as days when he was unable to consume alcohol due to incarceration, hospitalization or rehab, and used predefined "units" to calculate his rate of consumption. Based on the collected information, they determined that Bond consumed 92 units of alcohol per week, more than four times the recommended amount; his maximum consumption on a single day approached a staggering 50 units, and he went without alcohol on just 12.5 days out of a possible 87.5. The authors also note that Bond consumed 39 units of alcohol before getting behind the wheel of his Aston Martin in Casino Royale, which he subsequently crashed at high speed. "UK NHS recommendations for alcohol consumption state that an adult male should drink no more than 21 units a week, with no more than 4 units on any one day, and at least two alcohol free days a week. 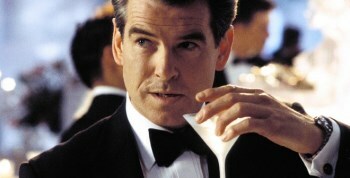 James Bond's drinking habits are well in excess of each of these three parameters," the authors state. "This level of consumption makes him a category 3 drinker (>60 g alcohol/day) and therefore in the highest risk group for malignancies, depression, hypertension, and cirrhosis. He is also at high risk of suffering from sexual dysfunction, which would considerably affect his womanizing." "James Bond's level of alcohol intake puts him at high risk of multiple alcohol related diseases and an early death. The level of functioning as displayed in the books is inconsistent with the physical, mental, and indeed sexual functioning expected from someone drinking this much alcohol," the study concludes. "We advise an immediate referral for further assessment and treatment, a reduction in alcohol consumption to safe levels, and suspect that the famous catchphrase 'shaken, not stirred' could be because of alcohol induced tremor affecting his hands." The study also noted that James Bond author Ian Fleming died of heart disease at age 56 "after a life notable for alcohol and tobacco excess" and added, "We suspect that Bond's life expectancy would be similar."